Well hello fall, and hello tornado season, I thought. I had run some errands so I was about an hour away from home and was trying to decide whether I should head to Middle-of-Corn, Kansas right then and attempt to beat the storm, or stay in the safety of the city and wait it out. Everyone knows that it’s extremely rare for Tornado’s to hit a city, I’ll just stay here, I thought. That of course is when I looked up at the stoplight which was attached to a warped and leaning pole and the businesses that had once surrounded the same stoplight were cleared to the foundation… Yup, I was in Joplin, Missouri. So then I was left with the decision, do I run home to my parents house in Oklahoma, which lies just 30 miles away from Joplin, or do I put on a brave face and point my Pontiac towards Kansas. 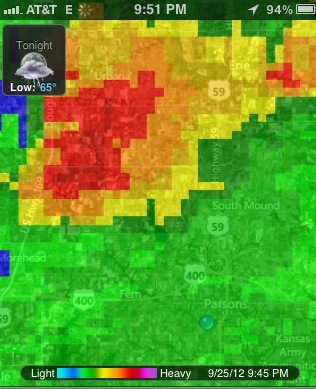 My attempt to check the weather radar on my phone. It would move and then freeze. AT&T is not Middle-of-Corn, Kansas friendly. Towards the heavy skies, illuminated with lightning strikes I headed. Kansas it was. I’m from Oklahoma. I’m tough. (They say if you don’t like the weather there, just wait five minutes, that my friends is the truth.) All Okie kids know what a funnel cloud looks like by the second grade. We know what it’s like to be woken up in the middle of the night by our parents to be taken to the cellar, and most of us have at least one tornado story. I have three of those stories, (but I’m not sharing them today) at one point I had pictures I had taken of a tornado on my cell phone, and I’m usually the goober running around outside in the storm watching the sky. However, here’s the thing about my Okie-Storm-Bravery-Toughness, I’ve always had a storm shelter/safe room to get too. So last night as I arrived at my Middle-of-Corn, Kansas hacienda, I realized three things, I don’t have TV channels to watch the weather, I have no internet and barely have phone service, oh and I have no where to go in the event of a tornado. It’s not like I haven’t tried to find a tornado shelter, but every time I’ve asked my neighbors where they go, they respond with, “Well I dunno, I’ve never had to deal with that before.” It takes everything I have not to roll my eyes and give an incredibly sarcastic response. But are you kidding me?!?!?!? This is KANSAS for crying out loud. It’s as much in Tornado Alley as Oklahoma! Okay I got scared. Sent a text to some friends asking to check the radar, and finally broke down and called my dad to ask him to watch the weather channel for me. Instead of being 20-something with super amounts of Okie-Storm-Bravery-Toughness, I felt like I was once again a wide-eyed 8-years-old in my pj’s and my moccasins, standing at the foot of my parents, asking if a tornado was going to get me. Dad assured me I was going to be fine, and well I woke up in one piece this morning so I guess he was right. There is about 100% chance I was being over dramatic about the whole situation, next time I’ll be better prepared. With that I would just like to say Happy Tornado Season. May the odds be ever in your favor. Sometimes when one feels threatened and in the “Escape Mode” and without an apparent alternative – – – – remember the outcome is often not as bad as we imagined. So, if “sucked up by a tornado, begin looking for a safe place to land. Oh Grand Dad, you have no idea how much this made me giggle. Thank you for your words of wisdom.